On behalf of our club’s new committee, I have the great pleasure of (re)welcoming you aboard and looking forward to another brilliant year of gaelic games across Europe. Though not widely known as a clairvoyant, Conchur’s prediction came true many times over: Belgium GAA finished the year as European champions in both women’s and men’s football, while the hurling and camogie teams were both runners-up in their respective championships – an extraordinary achievement and a testament to the hard work and dedication of last year’s committee, managers, trainers and players. 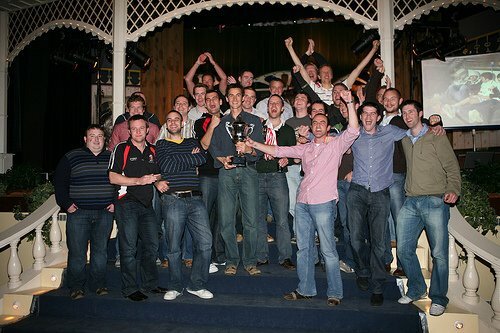 Our challenge this year is to use our 2008 success, both on and off the field, as a platform to make 2009 an even greater year for Belgium GAA. Your continuing commitment is the key. • Sat March 7: Men’s and women’s football tournament between Belgium, Clare Island GAA and Roger Casements GAA (Coventry) at Parc Cinquantenaire (P50), followed by dinner for 100 and presentations at Old Oak. • Sunday March 15: HUGE St Patrick’s Day celebrations in Bxl, culminating in games at P50. As was agreed at this year’s AGM the membership fee for the year will be maintained at 50€. Yes, only 50€ for having access to the 50enaire pitch 4 times a week for a large part of the year between all codes. 35€ for students and anyone unemployed. We ask that you please transfer this amount a.s.a.p. to the club account 363-0292739-33 with your name and mention “fees 2009”. Last year we gave a pair of club shorts and socks when the fee had been paid into the account. This too will remain unchanged for anyone wishing to get the club shorts and socks. For club members who already have the shorts and socks from previous year(s), these members who pay their membership fee will be entitled to a “10€ off” club gear that can be purchased via the Equipment Officer, Maria Brosnan. Is mise le meas, Olof Gill, Belgium GAA Chair 2009.